Pope Francis on Wednesday seized control of the Knights of Malta, an action that amounts to one sovereign country annexing another, if on a very small scale. Here's what led to the takeover and what it means for the Knights, the Vatican and the Catholic Church. The Knights of Malta is an ancient lay Catholic religious order that runs hospitals and clinics around the world. It counts 3,500 members and 100,000 staff and volunteers who lend first aid in war zones, natural disasters and conflict areas; members also make regular pilgrimages bringing the sick to Catholic shrines. The Knights trace their history to the 11th-century Crusades and are known for the aristocratic lineage of their members, their fancy, fringed uniforms, and the big Maltese cross that adorns their liturgical robes. Despite their name, they are based in Rome, where their headquarters has the same status as a foreign embassy. The headline-grabbing issue that prompted the takeover involves condoms: Several years ago, the order learned that its charity branch Malteser International was involved in aid programs that were distributing thousands of condoms in Myanmar. Church teaching forbids artificial contraception. The order's health minister at the time, Albrecht von Boeselager, stopped two of the three programs immediately and the third after the Vatican intervened. Boeselager went on to be elected grand chancellor — essentially the order's interior and foreign minister. This was raised when the Knights' leader, Matthew Festing, asked Boeselager to resign Dec. 6. After Boeslager refused, Festing opened a disciplinary process against him and suspended him. The two were known to not get along, and the order, like many private clubs, has factions along national and ideological lines. Festing's camp says Boeslager's refusal to obey the resignation order was "disgraceful" given Festing is the religious superior. Boeselager says Festing offered no valid reason for him to resign, and that he was therefore under no obligation to obey. The Vatican announced Dec. 22 that Francis had named a five-member commission to investigate Boeselager's ouster. The Knights refused to cooperate, citing their sovereignty and insisting that the pope had no business interfering since the removal of Boeselager was an act of internal governance. The Vatican doubled down and demanded cooperation. On Monday the pope heard the commission's report; on Tuesday the pope met with Festing; on Wednesday, the Vatican announced that Festing had resigned, that the pope had accepted the resignation, and that a papal delegate would be named to run the order. WHY IS THE VATICAN'S INTERVENTION PROBLEMATIC? Canon lawyers have said from the start that even the pope's investigation was problematic given the Knights' sovereign status. Now that the pope has taken over the order, the legal questions mount. Take, for example, the Vatican statement announcing the developments: It said the pope had "accepted" Festing's resignation, when under the order's own legal code, the pope has no role whatsoever in accepting or rejecting resignations of grand masters. "It's not for the Holy Father to accept the resignation of the Grand Master, it's for the sovereign council to accept it," noted Kurt Martens, a professor of canon law at the Catholic University of America. As if to drive home that point, the Knights issued a statement Wednesday saying the sovereign council would meet Jan. 28 to formally accept the resignation. In theory, the sovereign council could also reject it. The showdown has unfolded against the backdrop of Francis' increasing clashes with more conservative elements in the church, especially those for whom sexual ethics and doctrinal orthodoxy are paramount. It once again pitted Francis against Cardinal Raymond Burke, a leading conservative and critic of Francis who also happens to be the pope's envoy to the order. Burke was in the meeting when Festing asked Boeselager to resign. Burke is also one of four cardinals who have publicly called for the pope to clarify his position on the divisive moral issue of whether civilly remarried Catholics can receive Communion. 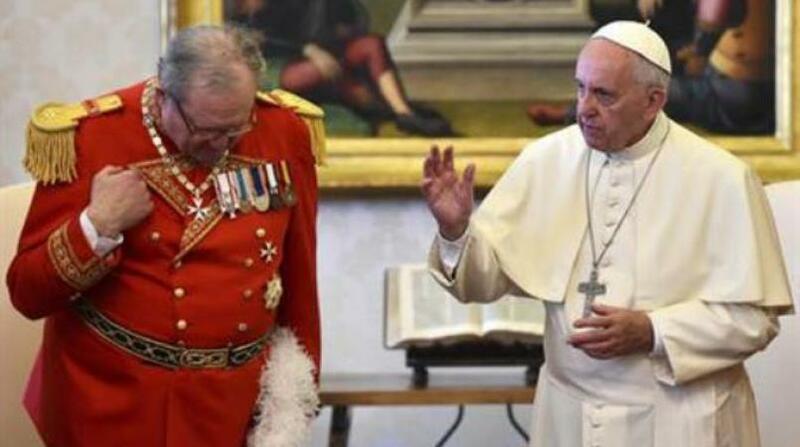 On a more personal level, Francis is known to have had poor relations with the Knights in his native Argentina, and while he certainly appreciates the Knights' charitable works, he has made clear he loathes the aristocratic pomp that the Knights relish. FEATURED IMAGE CAPTION: In this June 23, 2016 file photo, Pope Francis delivers his blessing during his meeting with Grand Master of the Knights of Malta Matthew Festing, left, at the Vatican. On Wednesday, Jan. 25, 2017 the Vatican said Pope Francis will name a pontifical delegate to run the embattled Knights of Malta, effectively taking over the sovereign lay catholic order after its leader Festing resigned in a bitter dispute with the pontiff over condoms.